Ubuntu 12.04 LTS "Precise Pangolin" will reach End-Of-Life in 28 April 2017 (44 days from today). This information released by Adam Conrad today (March 15th) in the official ubuntu-announce mailing list. The surprise is, Dustin Kirkland announces today in the same mailing list that Canonical offers paid Extended Security Maintenance (ESM) for Precise once it reaches End-Of-Life. 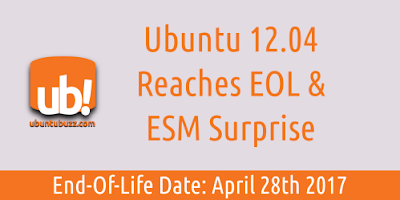 ESM is a new paid support from Canonical introduced in this year. For you Precise users, you may upgrade to newer supported version of Ubuntu, or replace it, or stay at Precise without updates with the old-archive repo, or stay at Precise and stay up-to-date by purchasing ESM support. Canonical will held a webinar in Wednesday, March 22nd at 4pm GMT / 12pm EDT / 9am PDT to discuss Extended Security Maintenance for 12.04 and anyone is invited to join here ubunt.eu/jL7cG6. If you want to know more about ESM directly from Canonical, this webinar is a good chance for you.